Within Teamwork Projects, you can select and manage multiple files at once, and delete, move, copy or download them in one go. In the Files area of your project, click the options (three dots) button to the top right, and choose Select Multiple Files from the dropdown menu. Alternatively, you can click m on your keyboard. Select the checkbox beside each file you want to manage, and you will see an additional set of options appear near the top of the files area. 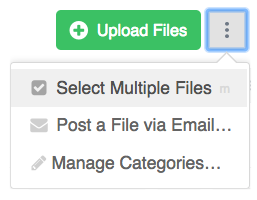 Once you have selected some files, click the Move or Copy button. In the copy/move modal, you will be able to choose whether you want to copy or move the files. 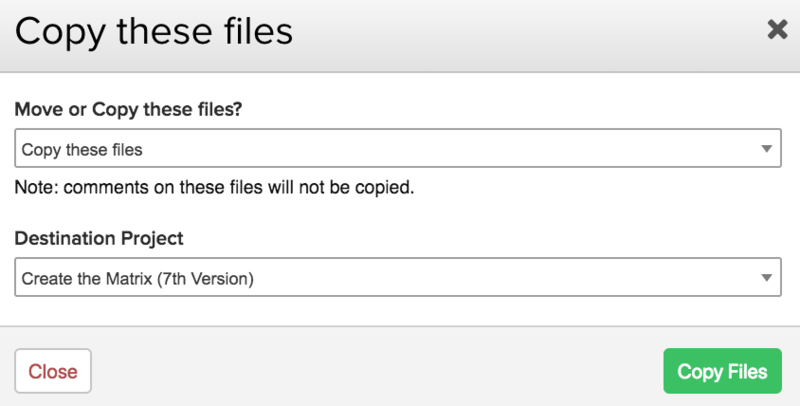 As with individual files, you can select a destination project to copy or move the files to. Note: When copying files, associated comments will not be copied. Note: If you choose to move a file you will be asked to confirm the move. If copying the files it will happen immediately. To move files to a different file category, you can drag and drop them on the category in the left pane in the files area. Select the files you want to delete, then click the Delete button near the top of the files area. You will be presented with a pop up to confirm that you want to delete the files. When choosing the download option for multiple files, the selected files will be downloaded in a single zip file.